The official rally route was going to be a very short day; 50 miles to Ouray for lunch then another 50-some miles to the hotel north of Durango. At dinner a few of us decided to take a longer route, up over Lizard Head Pass and visit Mesa Verde National Monument. At breakfast we agreed on a start time and place (the Conoco station just outside town), informed the Rally Organizers of our change in plans, and went back to our rooms to pack. Dad and I had a bit of time to kill so we thought we would run into the town of Telluride itself, so we left the hotel and proceeded down the hill into town. One of the D-type Jaguars followed us so I took some pictures and some movie footage with my digital camera. Unfortunately just as we were coming into town, some road construction delays stopped us. A photo out the top of the car is as close to old Telluride as I was able to get. We had to U-turn and get back to the Conoco. 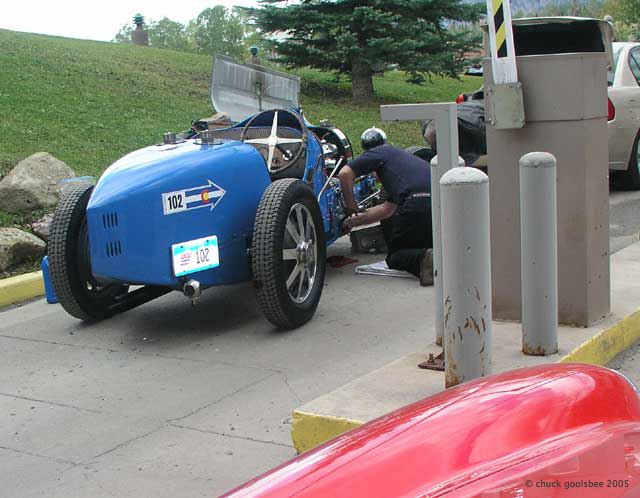 Above: A Bugatti getting some mechanical TLC at the start. 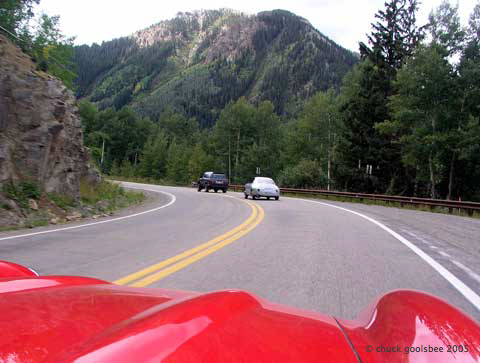 Above: A Jaguar D-type follows us out of Telluride's Mountain Village. Above: The town of Telluride, at the base of the San Juan mountains. 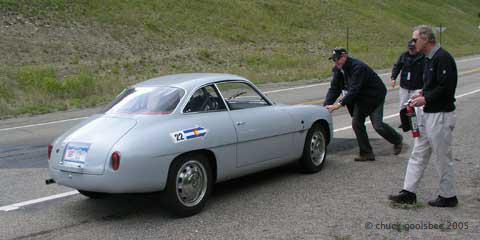 Above: Miles Collier fills up the little Alfa Romeo SZ1. Above: Sun on the San Juan mountains. 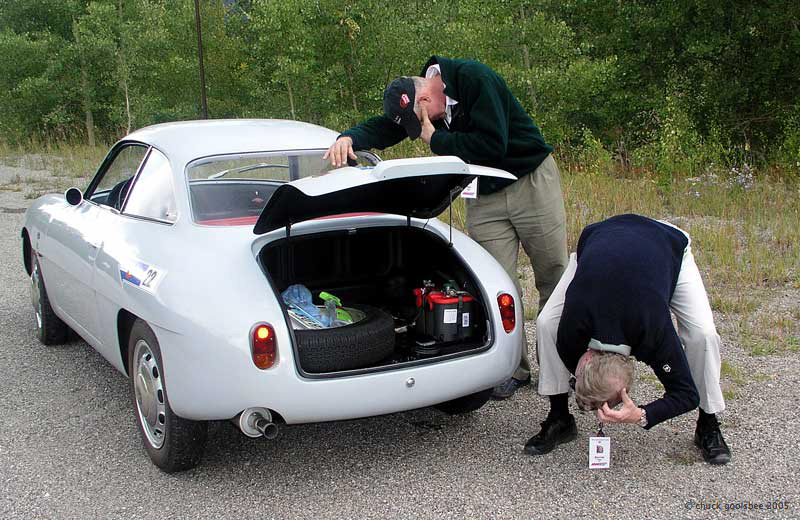 Our little three-car party was made up of Dad and I in the 300sl, Toby Silverton and Gary May in a 1956 Bristol 405, and Barron and Miles Collier in their gorgeous 1960 Alfa Romeo Sprint Zagato 1 (SZ1). 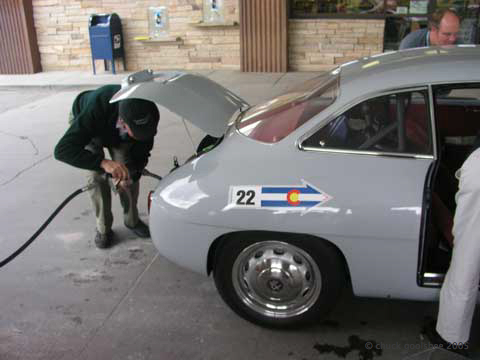 We met at the Conoco, and filled up our tanks, and headed south as everyone else went north. We had not gone more than five miles when our little expedition came to an ignoble and inconvenient end. Above: Just after this photo was taken, all hell broke loose. 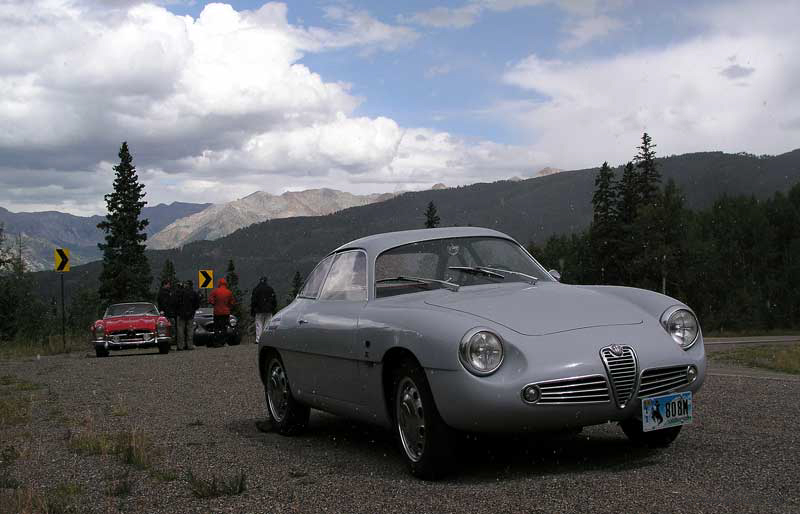 Dad and I were the middle car, running behind the Alfa. 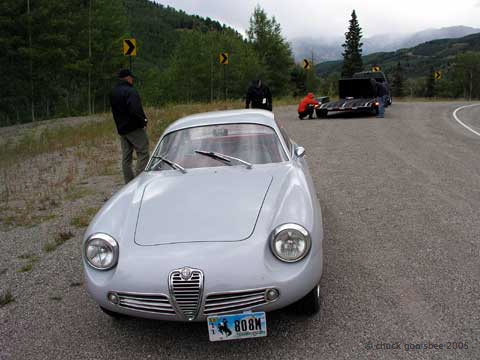 We watched in horror as the little Alfa ran over an 18" section of steel rebar lying on the road. 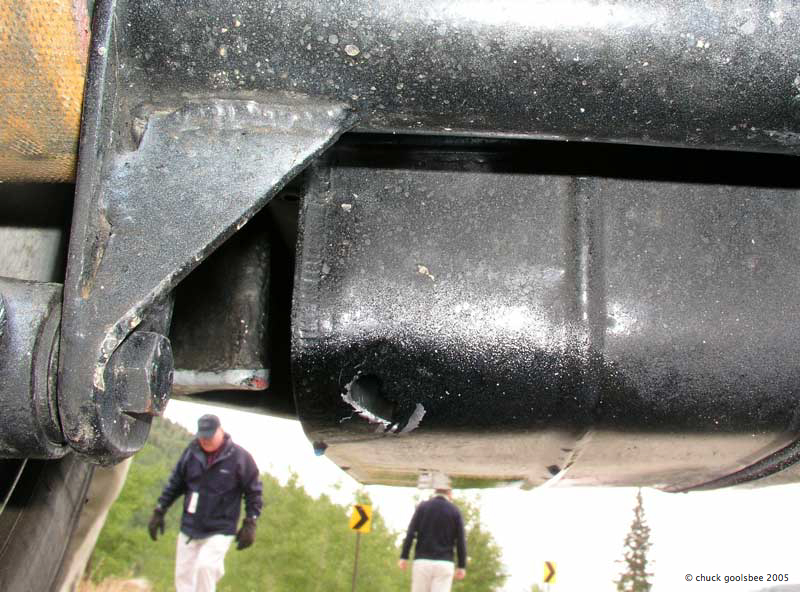 It bounced up and obviously punctured the gas tank. A loud clang and cloud of gasoline vapor burst from the rear of the SZ1! Thankfully there was no spark, or it would have been horrible. 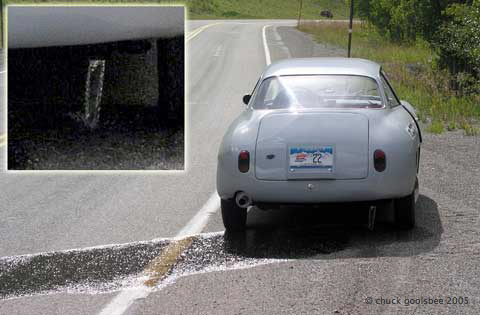 As it was a strong stream of gasoline poured from the Alfa onto the road. We signaled the Colliers and thankfully there was a wide spot at the next curve and they pulled over. Above: Gasoline pours from the gaping hole in the Alfa's tank. The car and area secured all we could do was wait for the gasoline to drain from the tank, (see banner shot at the top of the page) and then move the car away from the pool. I walked back down the road and retrieved the rebar from the road. No sense in anyone else puncturing something, and besides, I figured the Colliers would want it for a souvenir. Above: Miles Collier and his nemesis, a chunk of rebar. Above: Rolling the car away from the gasoline. Above: Miles and Barron in Alfa Agony. 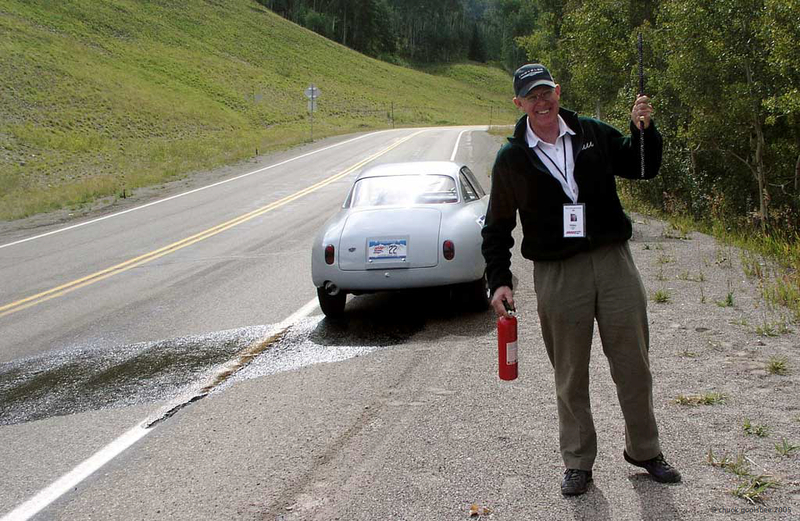 Once the fuel drained, we moved the car about 50 yards away from the gasoline on the ground and chocked all the cars with rocks to prevent them from rolling (it was a pretty steep hill). 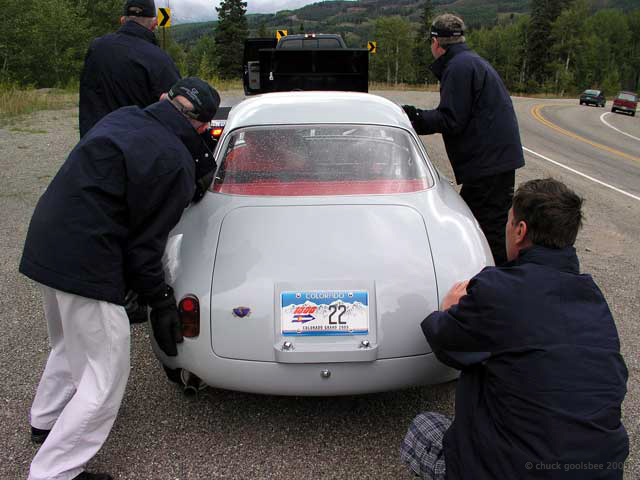 Phone calls were made and a Rally Mechanic was dispatched with a flatbed. Now all we had to do was wait. We spent a pleasant couple of hours chatting about cars and life by the side of the road while a few tourists stopped to take photos of us. Three curious cars and six curious men standing on the side of the road 50 yards from a hazardous waste spill. 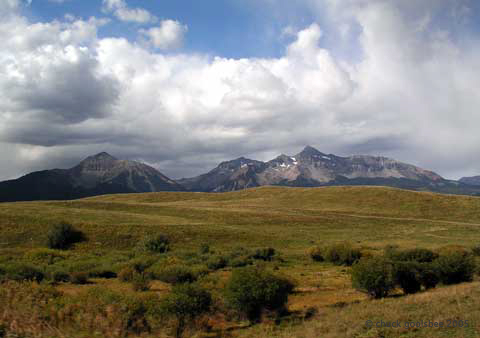 Of course being Colorado high country in late summer, the weather was variable between sun, rain and snow. We got plenty of each. I of course took pictures. 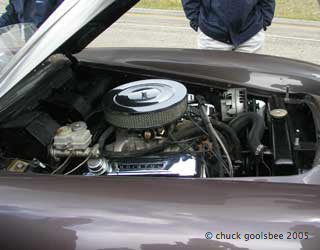 Above: checking out the Bristol's Chrysler V-8. Above: snow and rain on the Alfa. 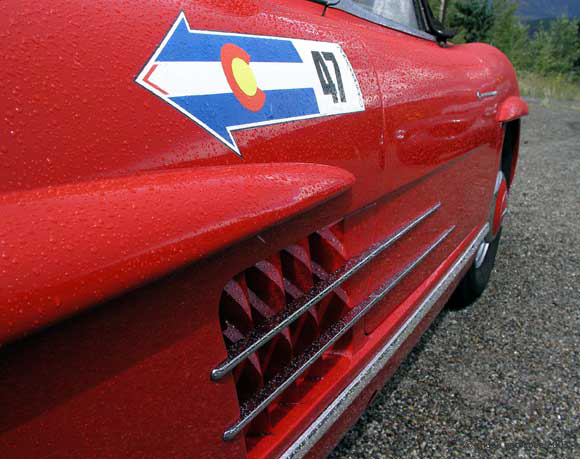 Above: Sun returns and melts snow on the 300sl. 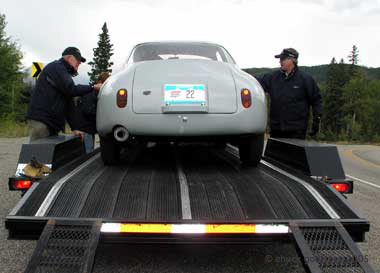 Eventually the flatbed arrived and we were able to push the amazingly light Alfa (Barron at the controls) up the ramps and onto the trailer! 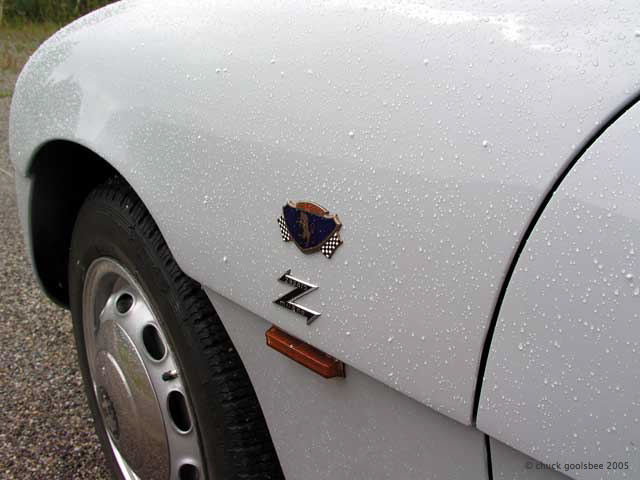 Miles accurately described the Zagato body work as "Reynolds Wrap" which required very careful placement of the hands of all us pushers. Above: Preparing to push the SZ1 up onto the flatbed. That adventure completed, the Bristol and Mercedes took off to catch up to the rest of the rally, as we've given up on Mesa Verde. 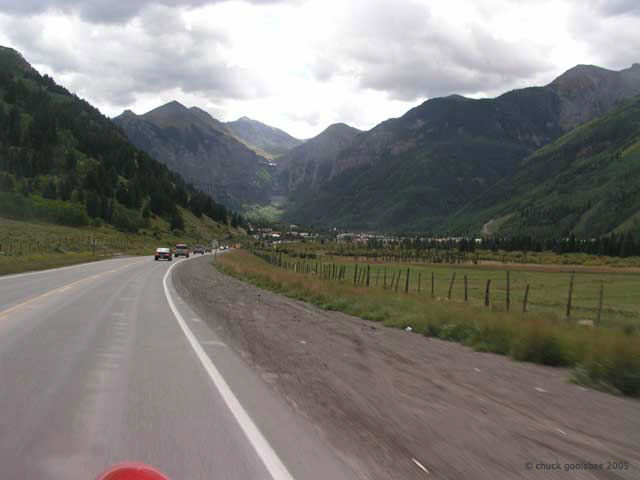 We retrace our route back to Telluride, and then back to Ridgeway and US HWY 550 where we were yesterday, but veer off towards Ouray. Above: Clouds ahead over Ouray. 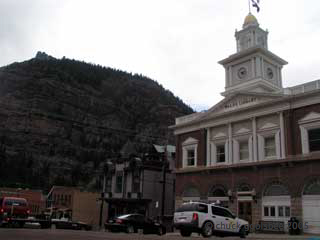 We drive to Ouray, where the rally had a scheduled lunch stop. It was now 1:30 and lunch was to end at 1:00, but thankfully we were not the only stragglers and were able to grab a bite to eat. 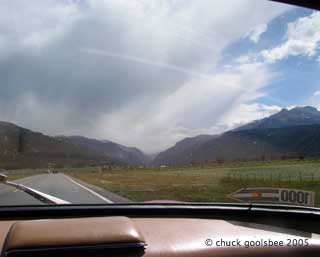 We left Ouray towards Silverton via the 'Million Dollar Hioghway' and the weather turned weird again. Rain sleet and snow. Eventually we made our way past the old Purgatory ski area to our destination, a resort this side of Durango. The weather was fine down here and all the rally cars were assembled together in the parking lot. Dad went to check us in and find our luggage, while I stayed behind and shot photos. Cars are meant to be DRIVEN and when you drive a car it gets dirty. Almost every one of these cars is a rolling museum piece (in fact a few are from museum collections), but instead of living a life as a static display we are DRIVING these cars as they were designed to do. My goal was to photograph the cars as they were. Dirty. If somebody was cleaning up their car, I didn't shoot it. But cars that were muddy, splattered, and covered in filth got my utmost attention. (note, it is late and I have to get to sleep. Tomorrow is a LONG day, so I don't have time to edit the "Dirty Car Pics" so you will just have to be patient. I promise I'll have them up soon. I hope you enjoyed today's eventful diary! --chuck) You can see all the raw, unedited, un-captioned photos from today here. OK, take me to the next day!